Some later Bassman 10’s had a MID control on the bass channel. Bassman 10’s produced between late 1980 and 1982 have a black control panel and Black White Silver grill cloth. Output increased to 70 watts when CBS switched to an ultra-linear output transformer. On the previous version of ampwares there was a module that queries ebay results and posted an average of the ending prices. The service that maintained the module stopped in may. I will be working in the near future to build a similar module for this version of the site. Actually, the final impedance for those amplifiers is 8 ohms total. (4) 32 ohm speakers wired in parallel for a total 8 ohm load. just had one restored by a reputable shop last winter and am loving it as a decent bass amp, a fair guitar amp (lacks break up that I desire in a tube circuit but makes up for it in power for low end crunchiness) and even as a surprisingly toney piano amp. Wish I had a Rhodes, the Roland sounds GREAT through it. I have a Bassman 10 that I bought new in 1972. It still works great and I’ve never had a problem with it. Everything is still original, never had to change a tube or anything. Could anyone tell me what it’s worth now? Being the original owner and if you kept it in good condition. You have approx. $850.00 value. $500 fair condition and $300 poor condition. Looking for a road case for one of these…anyone help? They build cases too? You have any experience with quality/price with them? http://support.fender.com/hc/en-us/article_attachments/115001870003/Bassman_10__1976_.pdf for the 76 version. There is one for the 70 watt also. I recently bought a 79 bassman ten, and its been blowing fuses like crazy. Any word of advice? Hi, Probably faulty power amp tubes. Can have intermittent short. Changing it may be the cure. If not, the amp is good for a professional check/overhaul… Pretty basic advice indeed, but i hope it will help. Does anybody know if Fender produced in the past years a “head” version of the “Ten” Silverface ?? I’m asking ‘cose there’s one here where I live, and I couldnt find any info in the .net about it. Everything look original. Its owner says its been made in early 70’s (1972). However I’m now tryin’ to find help in here. I have the budget, but … is it a real “Ten” head ?? I acquired a bassman 10 ,4×70 amp. the guy I got it from had cut the top off the amp, and tried or actually made a two piece amp. In other words, he tried to make a head with a 4×10 cabnet. I want to put it back the way it was. Where can I find a cabnet? please help……. Email us at info@mojotone.com about a replacement cabinet for your amp. Chris, I just acquired a bassman 10 cabinet in a trade this week. It will need your back panel, since someone in the past has remover the electronic from it, and closed the back with plywood. I will keep speakers and sell the cab. If you are interest, let me know asap. Jerry do you still have the Bassman 10 Cab? Recently bought a fender baseman 10, and as well as getting it serviced I wanted to buy a little stockpile of tubes and stuff so I’m ready to replace them when they blow. But I also want to buy spare fuses, and I’m not sure the exact type of fuse to use for this amp, can anyone help me? Or know what fuses to buy? Thanks. The Bassman 10 uses a 2-1/2 Amp, Slo-Blo fuse. It’s silkscreened on the back panel above the fuse holder. Party on! Hi, what country are you in Bud? Hello, I have a mid- 70’s Bassman Ten and would anyone know what the Potentiometer under the chassis and the pot on the far right of the rear panel adjust? The pots have no knobs, you have to use a straight blade screwdriver to move them. Hi Asa, those pots are for balancing the bias. Only for use by an amp technician. Don’t adjust them. I just picked up Bassman Ten from a guy moving out of state. Thank Jebus, Amen and all that. Wow, what a killer, affordable, versatile vintage Fender tube amp. I notice the stamped #’s on the rear, right hand side of the chassis (facing the amp) A58875. Does this translate to 1975 ? Hey what’s up. Still have your bassman 10? 500$? I have 4 (dials) volume, treble, midddle for BOTH (bass/instr) and the (normal) channels. I have 4 (dials) volume, treble, midddle, bass for BOTH (bass/instr) and the (normal) channels. Does anybody know where to find a protective bag like case for this amp? Thanks for finally writing about > Fender Silverface Bassman 10 | Ampwares < Loved it! I have a 1976 model and I need a replacement pilot bulb – what is the bulb specs please. I think it is a screw in ? GE 49 or Sylvania 755. It is a 6.3 volt bulb. I have one of these babies serial number A 000344. can any one confirm the year. I need to know where to get tolex for it as well all help is appreaciated. corrected serial number A 00344. FWIW there are several errors and unanswered questions in earlier comments. The ’77-80 silverface and ’81/82 blackface amps use an ultra linear output transformer, hitting the tubes with much higher plate voltages and pumping out up to 70 watts. These models use different speakers – 16 ohm speakers wired in parallel (NOT series as noted earlier – that would result in a 64 ohm load and an extreme load on the output transformer) for a 4-ohm load. This is unlike the Super Reverb, which uses 8 ohm speakers for a 2-ohm load. The ultralinear circuit also has one less tone control on the bass channel. From ’72-’76 Fender also produced the Bassman 50 head (50 watts), and the Bassman 70 head until the end of the run. Have anyone tried to install 19″ tilt back legs on Bassman Ten ? Will it fit? I just got one of these great amps! I found it at a GC a couple of weeks ago looking very used, with ripped tolex and marks all around the normal and bass #1 inputs. Someone tried to replace the grill cloth but didn’t get it tight enough. It looked very rough as only an amp that has seen a lot of use can look. I loved the sound but didn’t pull the trigger right away. It wasn’t long until I realized that I just couldn’t get it out of my mind. I had to have it. So I finally went and bought it. When I got it home, I thought that I would like to clean it up a little, but retain it’s awesome “patina.” I took everything apart, just leaving the speakers in the cabinet. I love seeing that hand wired, point to point electronics. 🙂 One weird thing is that the power switch is 180 degrees out. You have to turn it to “off” to turn it on. I wanted to see if I could easily flip that switch (while I had access to the inside). I found that there’s a groove cut in the threads (of the switch) that lines up with a point on the face plate. So it was obviously originally built this way. Strange! I left it alone. All I did was wash forty years of dirt and smoke off of it. I also ripped off any long flaps of streaming tolex (knowing that they would only further pull at surrounding tolex). I also re-did the new grill cloth nice and tight/straight. I put it all back together and it looks a lot better. What can I say? I absolutely love it! 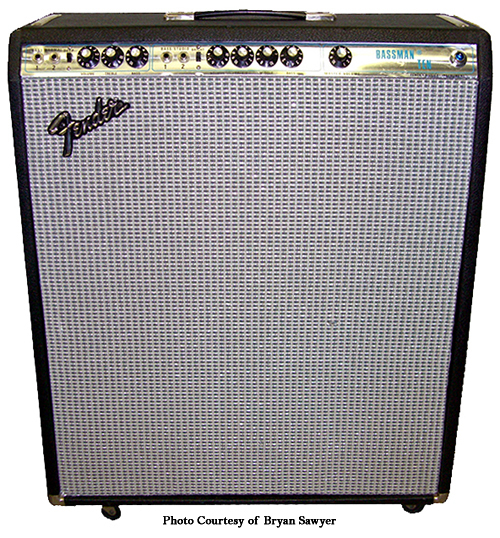 What amp circuit is the 1978 Fender Bassman Ten 4×10 combo? I want to blackface / “Marshallize” it, but I want to make sure I start with the right schematic. 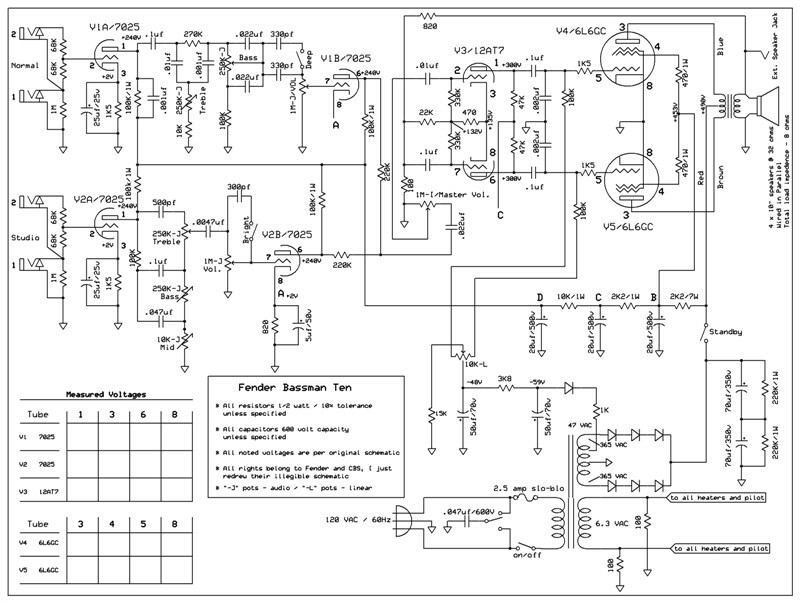 Anyone know of a schematic to add a third 12AX7? I have a Bassman Ten can with original speakers for sale, if someone is looking for one. The amp is not included as I have installed it in a new Mojotone super reverb cab. Do you still have the bassman ten cabinet and speakers? Are you still looking for a cabinet for a Bassman Ten? I know of a pristine Bassman Ten, but am only interested in the chassis. It has the original quad of 32 ohm CTS speakers and is in remarkable condition. I have a cabinet for the chassis, so would buy it if I could find a taker for the cabinet. Cordell, do you still have your bassman ten cabinet with speakers? Alan, I responded to an earlier post regarding your interest in acquiring a cabinet for a Bassman Ten. Please let me know if you are still looking. I found a complete amplifier in A+ condition. I only want the chassis. I am located in Florida. Where are you? Just had the mods on my 1978 Fender Bassman Ten completed! I gave it four Jensen 10″ Mod 10-30 speakers wired to 16 ohms. I had an amp tech go through and replace all of the tone caps to match that of the Fender Super Reverb specs. Replaced all of the tubes with 12AX7’s. Replaced all of the power caps. ( Quiet as brand new now!) Had the power tubes biased. My amp tech added a three way toggle switch it in the back that allows the amp to retain the stock Fender tone. Flip the switch another way, and you get a slightly overdriven blues tone. Silky smooth! Flip it the other way, and you’ll get a beautiful, rockin’ overdrive. This amp doesn’t start to wake up until the pre’s are dimed out, the channels jumpered, and the master is at 4-5. But at that volume in a house, your ears are going to bleed soon! A power attenuator is next on the shopping list! If you’re brave enough to play it at 6, you’ve got full on Marshall tone! He also added a new fuse, and new speaker plug, and a new power cable that was long overdue. And to think! Some kid thought he was ripping me off when he sold me the original amp with no speakers for just $60! $230 more in mods…and this thing is a tone monster! If you’re in the Indianapolis / Noblesville area, let me know, and I’ll send you his info. Did you take it to Uncle Albert’s, or is there another good tube amp shop in Indy? I have a bassman ten and would love to have it gone through like that. Thanks! The 50 watt version (72-77) has the windings for a tube rectifier. Easy mod for any competent tech, so I had it done to mine. I absolutely adore this amp. I put Jensen MOD10-35 speakers in it and thought it was perfect. Gigged with it for years. I routinely got laughs or funny looks at lugging such a huge amp around but the tone and booming presence always shut everyone up. It’s one of the most underrated and overlooked vintage fender amps in history. For $4-500 you can STILL pick up a relatively clean one and have a GREAT amp. Anyway, I had a baby and got married and became a square. 6 years later I still missed the amp, so I tracked it down through the guy I sold it to and bought it back. It’s never leaving again. It’s right beside my 65 Tremolux as my 2 all time favorite amps.